Full into the second half of the year — so how’s it going? Did you make a lot of blocks this month? I did a lot of sewing this past month. 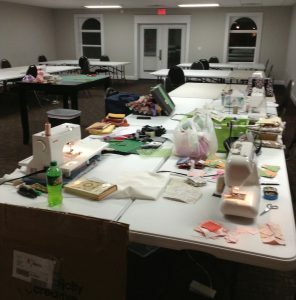 My friend, Victoria, came to visit me, and we rented the retreat center at the local quilt shop for 5 days, and we both got a LOT done — it was wonderful! We managed to take up the whole room and make quite a mess. Here’s some of it before we really got going . . .
And I did a lot of work on lots of other projects, setting together, and cutting and such — you know, all that filler that needs to be done, but doesn’t actually add up to finished blocks for awhile! I once again made a guild exchange block that I forgot to take a picture of, and then turned around and won the entire set of them! Another UFO! And . . . I’d take a picture of them, but since bringing them home, I can’t find them — go figure — obviously some more organizing needs to be taking place around here, but I’m too busy sewing! I stole this picture from Kelly, since I can’t find those blocks either! I’m making mine in reds and blues. I finished 12 blocks so far. Someday I might be able to show you a picture. I also took TWO pillow classes from my wonderful friend, Renee Nanneman, of Need’l Love. I’ll show pictures of those when I get them finished — I’m not counting them as blocks. If you missed it, it’s from my latest tutorial for Riley Blake’s Cutting Corners College, and you can get the pattern free. That’s a grand total of 69 blocks this month! Woohoo! I don’t expect August to be that productive block-wise — I have to get back at the longarm full time. And write — there’s lots of writing that needs doing . . . So now it’s your turn to report in. How did you do in July? Did you get to sew? Or were you too busy gardening, or going to the local fair, or taking your summer vacation? Summers are busy, aren’t they? Leave a comment and/or a link below, or contact me with your new totals, and I’ll get the project page updated. I’ve already updated it to reflect the new goal for August — 30 more blocks, for a total of 230 blocks for the year. I was gone so much this past month, I didn’t even take time to draw for a June prize winner, either, so here’s the winner for June: Cassandra! Everyone keep on stitching! Have a wonderful August — summer is whizzing by too fast! I got 92 blocks done! Most of that has been done in the last two weeks when my husband and son have been at Boy Scout Camp for part of that time! Lots of quiet sewing time when I am home from work! I made 138 blocks in July. I am really please with this number considering I didn’t find your block challenge until late in June. 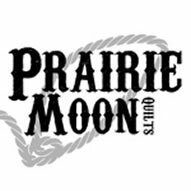 I have 4 quilts that need to be quilted so I guess that will be next on my to do list. I made 40 blocks.. Yay.. I guess..
As you said summer is busy so no blocks from me this month. On vacation for month of Aug so intend to make up for it. Machine and lots of projects in trailer ready to go. 40 blocks for me this month–20 Celtic Solstice, 6 Tell it to the Stars, 12 blocks for a quilt for my niece, and 2 spool blocks. Next month will be harder since we’ll be biking across our great state of CT for a week, and I’ll be busy getting ready for school to start. 81 for me…best month of the year so far…by one!! I got 5 blocks done this month for a quilt for my brother-in-law. 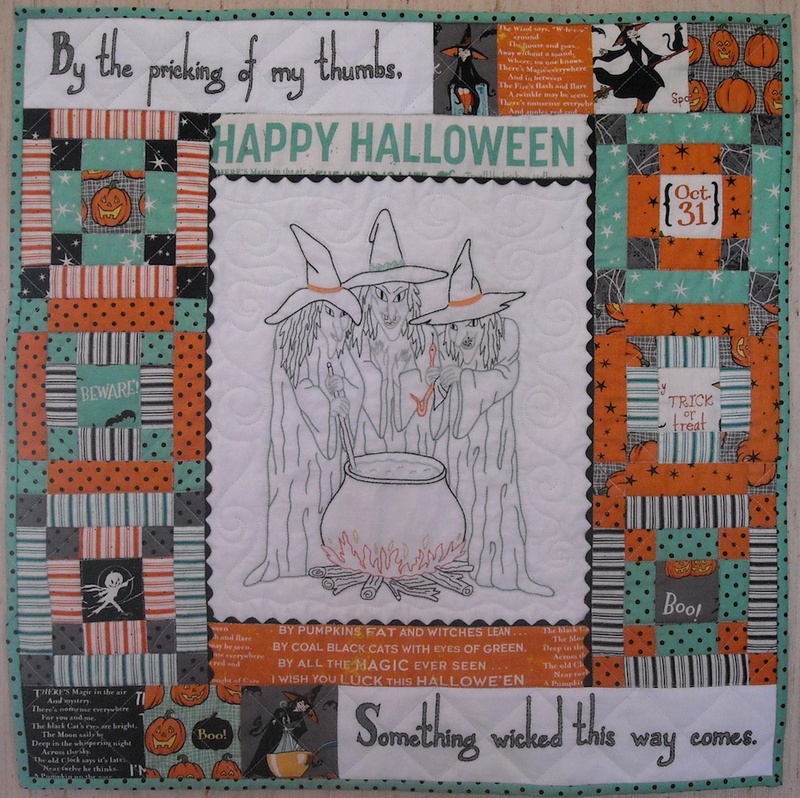 Since my quilts are all surprises this year, I haven’t been doing any blogging. So, I’ve been keeping a running draft post with all of my blocks each month so I can blog at the end of the year. That showed me that I forgot all about the previous 11 blocks that I made for the same quilt! With this month’s 5 and the 11 that I never counted from March, I’m now up to 468 blocks for the year. 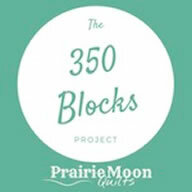 Thanks so much for hosting the 350 blocks project. I love keeping track of my progress. July was a bust for sewing. Vacation, celebration of life and company. August will be better! I only did 32 blocks this month. I also only made 32 blocks this month. 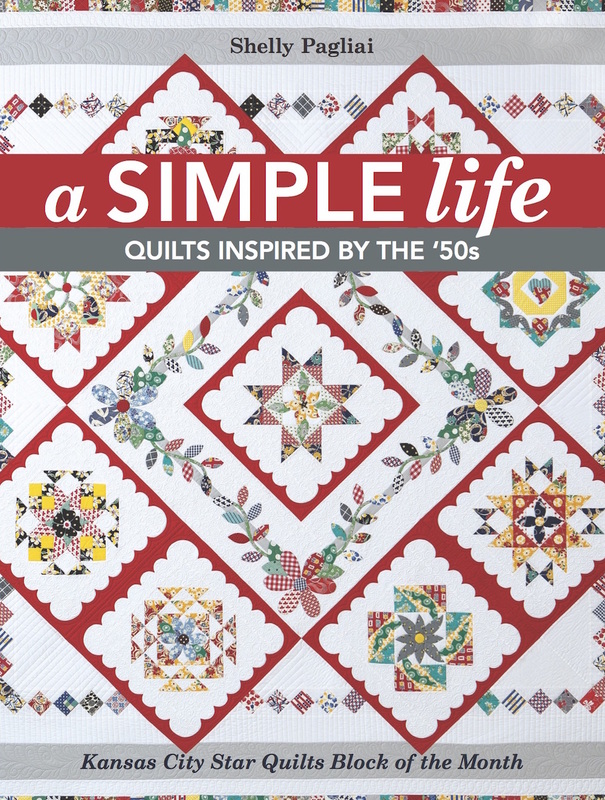 Summer is NOT the prime time for me for quilting or sewing…too many kids activities, but I wouldn’t change it for the world! Your retreat looks like it was so much fun! And productive! Wow! Way to go! Didn’t sew anything except a hole in some pants. Lots of fun vacation activities though. Life is what happens while you were making other plans–that is the story of July for me. I thought it would be a great month to get caught up on blocks. Instead I was caught by surprise with pneumonia. Drat! But, I did get some blocks done, 28 to be exact. That puts me at 177 for the year. Here’s hoping August will be a strong sewing month. No blocks this month but not a totally unsuccessful month. I finished the bumper pads and bed skirt to go with the baby quilt I finished last month. Just have pads for the rocking chair to make and that project will be all done. 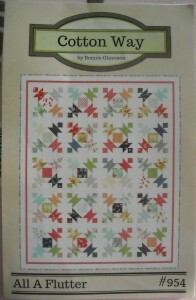 This month I must put together and finish a quilt that I have all the blocks made for. 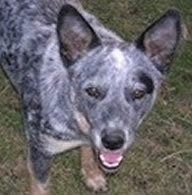 It will go for a silent auction for the Chamber of Commerce Ward Jamboree. 415 blocks for me total, with 82 new this month! 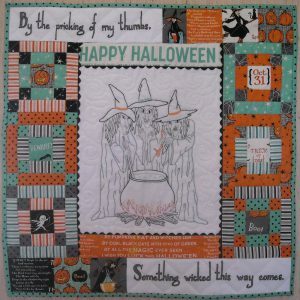 I only made 30 blocks this month, all split nine patch. 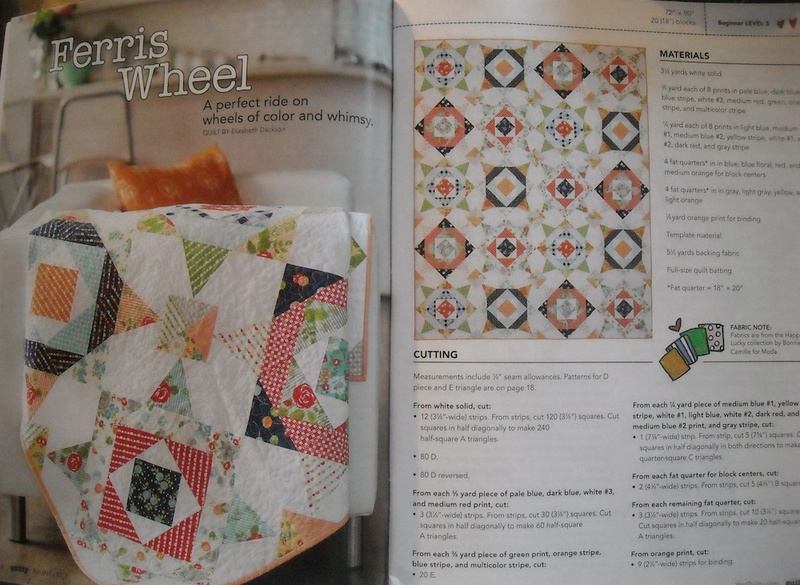 The rest of the month was spent playing at summer and quilting that stack of quilt tops in my sewing room. Oh well, it all counts, right? Well, I did more than my sister. I made 11 blocks. I also quilted a community service quilt and a whole cloth quickie for my daughter. And I started a WHOLE Bunch of stuff. My favorite kind of month. However, this month I really have to quilt a couple more things. I want quilting and not piecing and starting to be my primary activities for a while. Oops, I just realized that I haven’t been reporting my totals for the last few months. I made 18 blocks in April, 97 in May, 58 in June, and 25 in July. I believe that should bring my total to 439. I made 72 blocks in July, nothing like simple 9-patch and snowball blocks to up the numbers. Best of all, I have another project almost finished, just need to complete the quilting. Hi Shelly: I forgot to post my June total: 20 blocks. Low because I actually finished a quilt and gave it away for a wedding present. July has been a sewing month because I have another wedding coming up and I pieced a Film at Five quilt set 6 x 6 using 2″ squares and background for sashing and cornerstones in dark blue kona “Storm”. I have all the blocks and pieced sashing and cornerstones done and I’m counting each as a block because of all the seams in the pieced sashing. I also pieced a guild block and patchwork for a cute pouch. Grand Total for July: 158 blocks! TA-DA! !